“The only way of discovering the limits of the possible is to venture a little way past them into the impossible,” go one of Sir Arthur C Clarke’s law. The renowned fiction writer and futurist died yesterday in Sri Lanka, bringing to end one of the most colorful and eventful of lives. I haven’t read any of Sir Arthur’s novel, only a few short stories (including the 10 word story he wrote for the Wired Magazine, “God said, ‘Cancel Program GENESIS.’ The universe ceased to exist.”). But I have always been fascinated by him, a man who spoke about distant stars and alien beings. It is probably because at a primal level, we all are fascinated by the universe that shifts over our tiny heads day and night. Everyday, when I peer into that starry sky, I think of the millions and billions of years that have passed. 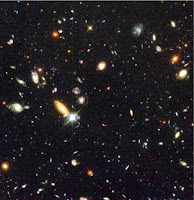 That tiny spot of light, indicating a star, quasar, or whatever, has travelled through billions of years, infinite space and today I am able to see it. This star, quasar or whatever, might not even exist now. Or for the matter the whole sky might be so very different at this given moment, but then I will never know. Some other soul, probably some billions of years later would probably be standing at some point (surely not Earth, because it would cease to exist by then) in this galaxy and when he/she or it looks up would see how the universe looks right now for us. For this very reason, I like Sir Arthur, he humanised science fiction. In many ways, he liberated our fantasies, gave them wings on which they could fly. Oh how I wish I could have spent a life writing on the mysteries that surround us all over. But the best that I could write is how an amazing Indian firm is digitizing the universe, turning the stars into simple bits and bytes. I had done this story a year and more back and on learning of Sir Arthur’s death, I was just thinking about the sky and the moon, when this story came to me. And for this very reason, I am uploading this story. He had stated once that he would want his epitaph to read; ”He never grew up; but he never stopped growing”. May he continue in some way his universal journey, in some form or the other. The diners at the canteen of of Inter University Centre for Astronomy and Astrophysics (IUCAA) look up at the placard (with the quote on it), smile to themselves and continue with their food quite unperturbed by the supposition. Without a micron of a doubt, not all agree with the Brilaat–Savarin because at IUCAA, life is all about finding newer galaxies, tripping over black holes and extrapolating on the nature of things in the ever so distant universe. Established in 1988, IUCAA’s mandate was to carry out research in theoretical astrophysics, cosmology and in observational astronomy. With all the major universities and research institutes in India and abroad collaborating at IUCAA, the center has become a vast storehouse of learning and research in the field. But it was at the turn of the millennium that IUCAA came into international limelight. Around that time, the Virtual Observatory (VO) concept was taking shape internationally and Ajit Kembhavi, a renowned figure in astrophysics and astronomy, heard about the project from his colleagues based on the international shores. Kembhavi was immediately hooked on by the VO idea and it does not take rocket science to figure why? Over the years, the biggest problem faced by astronomers and researchers alike is that of making accurate celestial observations. Guesstimates vary on the number of celestial objects in the universe, from a few hundred million to few thousand billions, making it harder for astronomers to really pin down their observations. To make such observations, astronomers require high-end instruments capable of peering into the distant space and the only place they are available are a few observatories across the globe. There is a long list of people who have booked slots at such observatories. VO intends to solve this problem of demand-supply permanently using the latest that computing power has to offer. Every night, as high-powered telescopes scan the sky from different angles, data collected from them is digitized and uploaded on a central location from where it can be accessed by researchers. Sounds fairly simple, except for the fact that the data generated by these surveys runs into terabytes (1024 gigabyte equals one terabyte). “For instance, the Sloan Digital Sky Survey (SDSS) project generates a few terabytes of data every night,” says Kembhavi. Thus, when SDSS– DR3 data, running into a few terabytes, was to be shipped to IUCAA in Pune from John Hopkins University, the university bought special hardware drives and then shipped them manually to India. “Even with a high-speed connection, it could take around a month to transfer this data via Internet,” explains Kembhavi. The ability to analyze this humongous amount of data is a bigger challenge than storing it. And that is where India, precisely Indian IT, comes into play. Kembhavi was well aware of the data issue and came up with the idea that India will contribute to development of new applications and technology that will aid in storage as well as analysis of data. On this basis, India became a founding member of the VO program and VO-India or VO-I was born. If the concept was brilliant, the implementation was even more radical. To achieve his objective, Kembhavi enlisted the support of Anand Deshpande, CEO, Persistent Systems, an IT company based in Pune. “I knew Deshpande from the days when IUCAA provided basic e-mail facilities, limited bandwidth and electronic access to some journals to several university centers, several years ago. That time, Deshpande used to visit the campus to access his e-mails. Thus, when I discussed the idea of collaborating on the project, he readily agreed and that is how we got going,” says Kembhavi. With funding from the Ministry of Communications and Information Technology, the project got rolling. Persistent pitched in with its software engineers and set up a dedicated team to develop applications and work on new technologies in close collaboration with the team at IUCAA. The results have been quite heartening till date: VO-I has come up with applications like VOPlot, VOStat, VOTable and others. Of the lot, VOPlot has received the maximum acclaim. It is a stand-alone system with high-end graphic user interface that can be downloaded from the IUCAA server. The tool has been integrated by many databases used in the study of stars and is available in three versions, VOPlot, VOPlot 3D and VOMegaPlot. The gains are mutual according to Kembhavi. “We gain from their (Persistent) software expertise and they are gain from the challenges thrown up as huge amounts of data that needs to be managed and analyzed,” he said. Even, Microsoft is taking a keen interest in the development of the VO project globally. It is not astronomy that can benefit from the development of such tools; there can be quite many commercial applications according to Kembhavi. “Any work that requires high amount of data analysis can use these tools like VOPlot and VOStat. For instance, population census is one such field or for that matter retail market analysis, where there are huge number of small transactions that need to be analyzed,” adds Kembhavi. Looking forward, VO-I has become a potent force in the global initiative. Kembhavi is also quite excited at the prospect of advancement of science. Using these tools, a lady researcher was able to discover a sub-dwarf star, “the second known one in the galaxy,” exults Kembhavi. Sitting at his comfortable office, full of books on astronomy, physics and IT, Kembhavi is dreaming up newer projects, grander in design and objectives. In spite of spending so many of his years gazing at the heavens, Kembhavi is still immensely fascinated by the stars and planets. He is of the view that we (humans) are not alone in the universe, who knows with the aid of tools developed by his team, there is finally proof of it. Kembhavi is trying real hard.